Asian stocks rose broadly on Tuesday to extend gains from the previous session as tensions between the U.S. and North Korea eased further, helping boost investor appetite for riskier assets. The dollar climbed for a second day after both Korean and U.S. leaders indicated a willingness to avert a deepening crisis over North Korea’s nuclear program. Oil prices steadied after sharp overnight falls while gold edged lower on rising risk appetite. Chinese shares closed higher, although gains remained muted after a strong rally in the previous session. The benchmark Shanghai Composite index rose 13.90 points or 0.43 percent to 3,251.26, led by banks after commercial lenders reported higher first-half profits than a year earlier. Hong Kong’s Hang Seng index was down about 0.3 percent at 27,174 in late trade. Japanese shares snapped a four-day losing streak as the yen weakened against the dollar for a second day running and data showed Japan’s industrial production rebounded more than initially estimated in June. 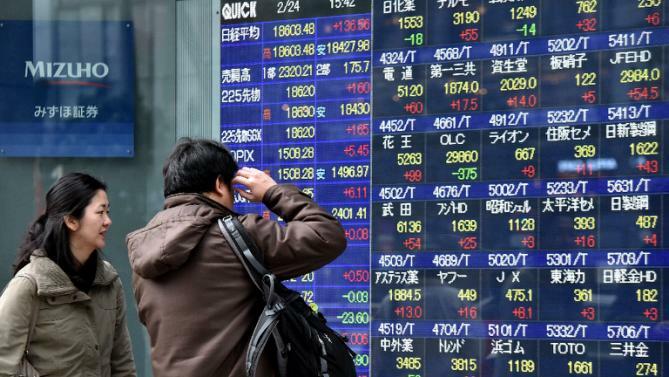 The Nikkei average rebounded from a three-month low to end higher by 216 points or 1.11 percent at 19,753.31, while the broader Topix index rose 1.07 percent to 1,616.21. Automakers, financials and technology stocks led the surge. Australian shares extended gains from the previous session, with both S&P/ASX 200 index and the All Ordinaries index ending up about half a percent at 5,757 and 5,804, respectively. Lender Australia and New Zealand Banking Group rose 1.3 percent after reporting a 5.3 percent rise in third-quarter cash profit. Rival Westpac gained 0.7 percent and NAB added 0.6 percent after minutes from the Reserve Bank of Australia’s August policy meeting showed the central bank was confident of achieving “above potential” growth in the coming months without any change in interest rates. Investors shrugged off a weekly survey compiled by the ANZ bank and Roy Morgan Research showing that Australia’s consumer confidence weakened for the second straight time during the week ended August 13. Healthcare company CSL and telecommunication giant Telstra were among the other prominent gainers. Domino’s Pizza Enterprises plunged 18.8 percent after the company missed full-year profit expectations.